Our 24 hour pet hospital in Oklahoma City also serves Edmond, Enid, Guthrie, Lawton, Midwest City, Mustang, Moore, Norman, Shawnee and Yukon, along with north Texas and the Texas panhandle. 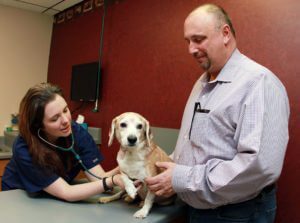 For years, an Oklahoma City emergency vet clinic sat beside an Oklahoma City veterinary surgery center. The two practices, with separate owners, would enlist each other’s services at times. But in 2014, the union became official when they became part of BluePearl, a national network of pet emergency hospitals. BluePearl then brought the two practices together in a new, state-of-the-art home. 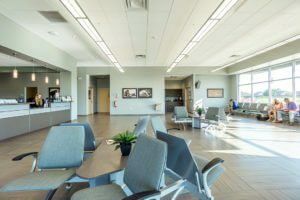 The result is BluePearl Oklahoma City, our 19,000-square-foot specialty and emergency animal hospital, which has an MRI and a CT scanner on site. Our advanced diagnostics also include endoscopy, fluoroscopy, arthroscopy and ultrasound equipment. Having everything under the same roof allows our emergency veterinarians and specialists to coordinate your pet’s care without skipping a beat. The former hospitals in Oklahoma City were previously known as Veterinary Emergency and Critical Care and the Veterinary Surgery Center.